That evening, we sat around the campfire under a gorgeous full moon and introduced ourselves to the other pilots. The group was mostly local guys with a few from adjacent states. I didn’t know anybody and was working hard to remember names. The next time I run into Mike (or is it Mark?) Weber, I’m going to recognize him…. I promise. Friday morning was excellent! I was at the field before sunrise and got in a nice long flight. The wind was blowing 15 mph from the north so I didn’t travel far but I did go to 2000 ft and got a good feel for the area. 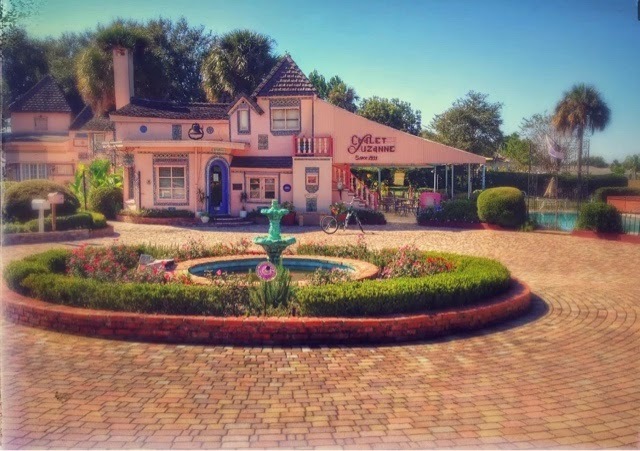 The most notable landmark was a Deco styled tower which was built in the 30s on a meager little hill that is reported to be the highest point of land in Florida. It denotes a neighborhood that was and is still populated by the super rich. Of course, we were warned to stay clear of the area. The afternoon was another story. The first launch was a bust with the wing coming up crookedly and the second was a disaster. Apparently, one of the lines came out of its keeper and caught the zip tie during initial inflation. 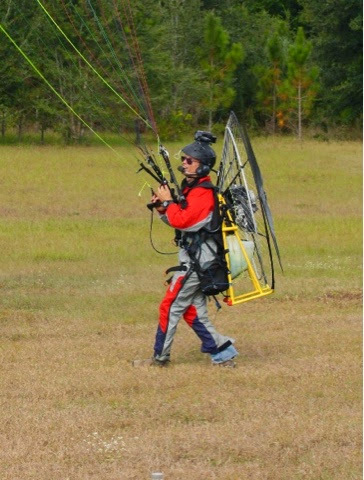 The wing came up crazy and with the help of a little wind …. I went into a slow turtle. Totally frustrated and embarrassed I unclipped and jumped to right the rig before every mothers son ran over to save me. 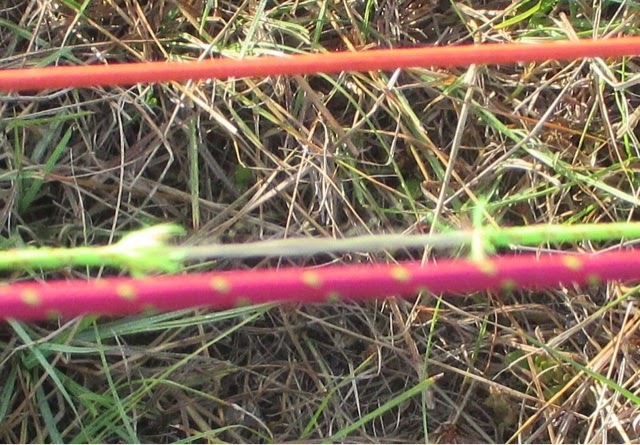 The offending line was damaged where it caught on the zip tie holding the keeper. The sheath had been severed and the keeper was gone. The pressure on the lines must have been tremendous because the keeper was one of those hugely thick 3/8ths zip ties. It’s hard to imagine a single line breaking such a stout piece of plastic. With two bad launch attempts, including a turtle, I felt like the slow kit in the smart class. I was determined to fly before sunset to save what ego I had left. So…. I stripped some electrical tape off the cage and taped up the lines to make a temporary keeper for my third attempt. 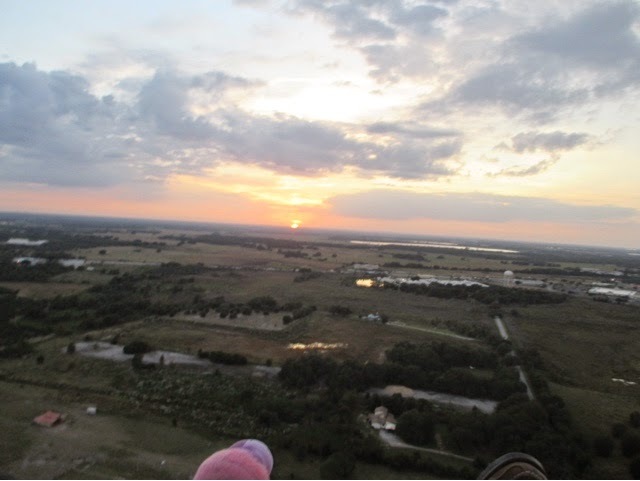 The third launch was a non-event….. And a nice but short flight. Of course, the best part of any fly-in is getting to see my PPG family. If yesterday I was surprised not to know anybody, Friday the Tribe showed up. I chatted with Eric Dufour who had brought a bunch of students down from Christmas Florida. He told me that he and Elizabeth are moving to Valkaria, they are going to move out of the trailer and into a real house a shop for Elizabeth. It will be nice to visit them. 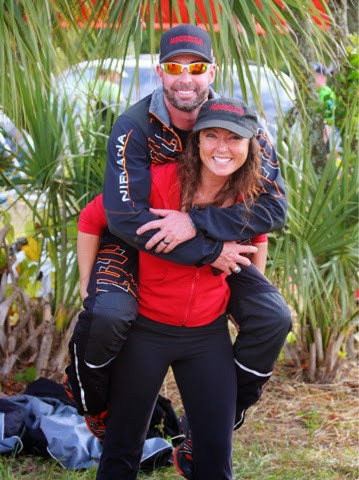 Ryan Shaw and Jessica came from Arizona to support Nirvana / Paramania and Jeff Goin and Tim Kaiser flew the chopper over from Polk City. That evening we all went out for dinner at Sizzling. It was great to spend time with everybody. These guys were my support during the dark years and I’ll forever cherish their friendship. Saturday morning was cool with a steady breeze. I launched clean and enjoyed an hour and 15 minutes playing around. 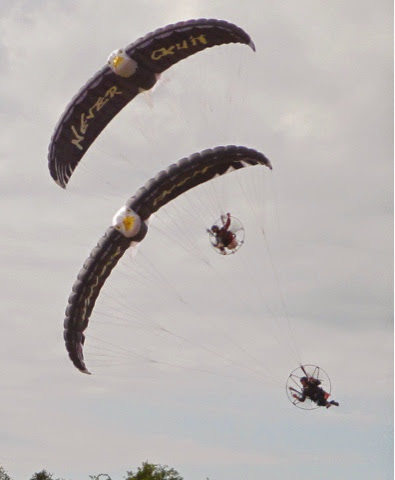 During the landing I was treated to the sight of two eagle wings flying over the field. 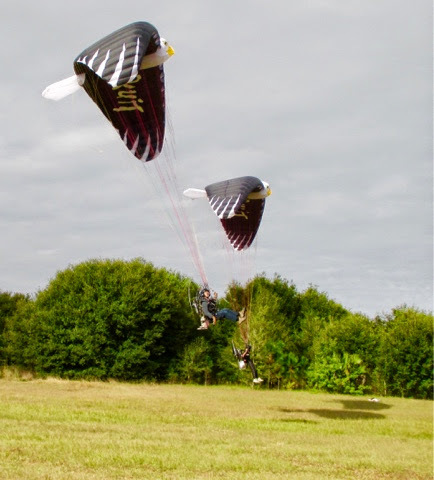 Eric Dufour had arranged for a couple of Elizabeth’s custom wings to be available and two competent pilots were putting on a show and Jeff trailed them shooting video. 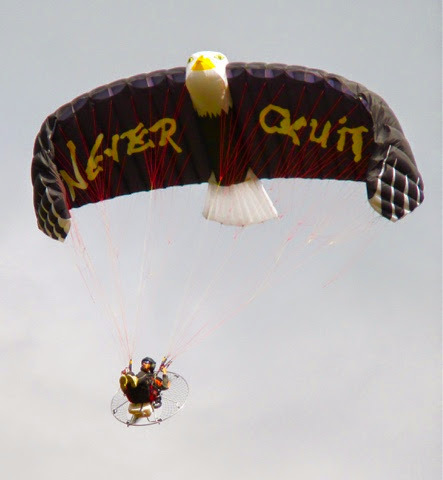 About this time Bob Harrison showed up and he, Mike and I were outstanding in our field enjoying the “Never Quit” birds. I especially like the way they would pull big ears to make the birds more realistic. Later when I was packing the cooler I noticed that there was one Ginger beer left, so I jumped on the bike and ran it over to Jeff and Tim’s RV. It’s fun to drink and it might give some relief if any of their passengers get airsick. Then on the way back, I ran into Terry Lutke and his wife…. what a surprise!! They were in the area helping her folks move into winter quarters. We had a nice visit while I packed. We talked about possibly getting together before they headed back up north. I hope they do swing down to Charlotte Harbor. It will be fun to show them around and possibly fly Pine Island and even better, if they have the time to stay the night and be our first house guests. Thanks Eric, for putting this on. It was great! Good luck to you with Avaitor PPG. A few flights at Shell Creek. Solo with no drama or anything of note. There was however a notable event this week. 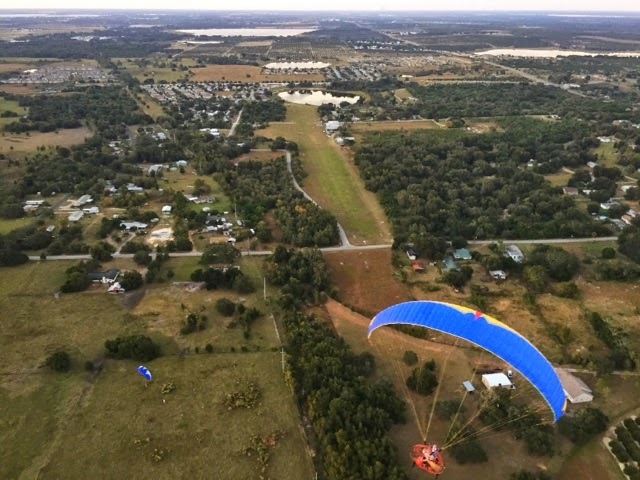 Bruce and Diana Budy stopped in Punta Gorda while on their way to spend a few days in the keys. 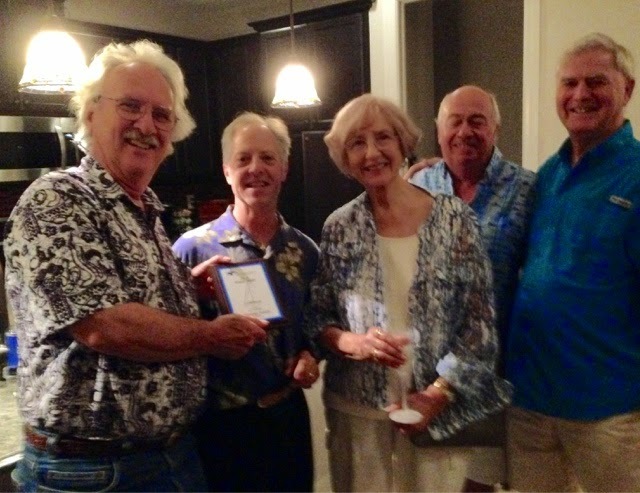 Graham Pryce rallied the SW Florida Chapter of the Colorado Sail and Yacht Club to have an impromptu dinner party. After stopping at Chris Heelis’s house the came to our new home to check it out. I popped a bottle of Champagne and while we were toasting the new digs, Bruce surprised me with a trophy for the 2014 Spring series. Nobody could explain how or why a trophy had been commissioned. 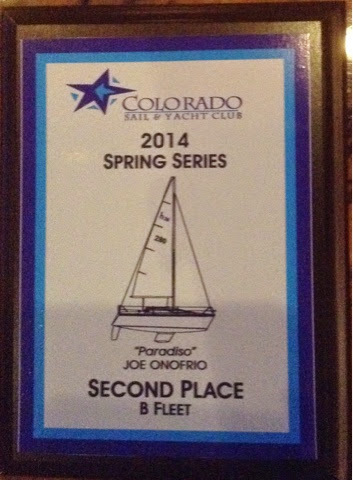 I had not raced with the CSYC in two years but there it was a 2nd place B Fleet trophy. According to Bruce, they were totally surprised when the Commodore announced my name during the award ceremony. I was equally surprised to receive the award in Florida. Later we went to Lashley’s Crab House for dinner. It was excellent. The Snow Crab was available and for 25 bucks we all had our fill.